I love labels. I told you so right here. So the offer to review Name Bubbles labels was one I couldn't refuse. 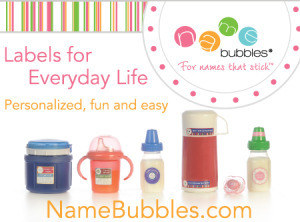 Name Bubbles, "For names that stick," are personalized waterproof labels. They're not only waterproof, though, they're microwave safe, and they stay put through dish washings (yes, even in the dishwasher) and laundry washings. Name Bubbles are meant for anything and everything one might want to mark as theirs. With the free sample pack provided by Name Bubbles — the "Sports Pack" of 75 total of mini, fun, square, bitty, and bubble toes press and stick stickers, marked with with his full real name (which is why you won't see close-up photos of the labels here) — Bubby decided to mark as his the following. He loved them. And because the sample pack was plentiful, he has plenty more for using later. And for mom to use later to personalize his shoes and clothes when preschool starts up again this fall. What I love about Name Bubbles: The sample pack included a variety of sizes and shapes of the durable vinyl stickers. Also, they really stick ... well. What I didn't love so much: The sample pack came in rather boring black-and-white colors. Fortunately for those who pay for their Name Bubbles, there's a plethora of happy color palettes from which to choose. 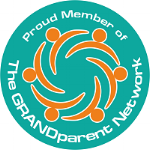 Bottom line: Name Bubbles (with varying prices, depending on pack purchased) are a great option for personalizing a child's items, whether just for fun or to ensure items return to their proper owner at the end of outings and functions.